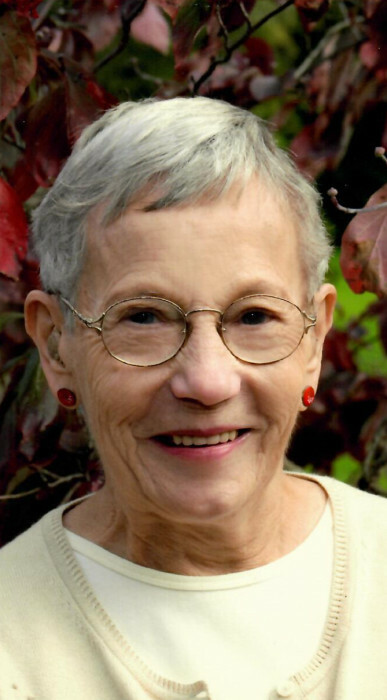 Obituary for Ruth Gertrude Garman Shiffler | Cronrath-Grenoble Funeral Home, Inc.
Ruth Gertrude Garman Shiffler, 94, of 816 Stein Lane, passed away on April 2, 2019. Ruth was born on October 17, 1924 in Altoona, PA, the third daughter and youngest child of the late Frederick and Alice (Lowe) Garman. On February 23, 1946, during her senior year in college, Ruth took a weekend break and married Neil Frederick Shiffler, a fellow Altoona native she’d known since youth church camp. Neil had only recently returned from the World War II European theatre but had asked her parents for her hand in marriage while still overseas. The couple were married in Altoona, PA at the First Methodist Church. A brief honeymoon to the Poconos followed before school work again beckoned. Neil preceded her in death on November 16, 2000, breaking a union of almost 55 years. Unbeknownst to many, Ruth was an accomplished violinist in her younger years. She began playing the violin at age five under the tutelage of her father, who himself played the violin, viola, and cello. At age 12, playing alongside her father, she became the youngest member of the Altoona Civic Orchestra, an orchestra comprised of musically talented community members. She was so small they had to specially fashion a seat and music stand for her. Ruth went on to play her violin in the Altoona High School Orchestra until her high school graduation in 1942. Her practice and talent paid off when she was honored to play 1st chair during her junior and senior years. With the orchestra, Ruth appeared in many school productions: the Concert of the Choruses, the English Department Play, the Annual Show, the Christmas Pageant, and the P.T.A. meetings, to name a few. They played such orchestral selections as “Rhapsody in Blue” by Gershwin, “Tannhauser March” by Wagner, “Prelude” by Jarnefelt, and “Reve Angelique” by Rubenstein, all difficult pieces which added variety to the programs. Outside of orchestra practice and performance time, Ruth could often be found playing in duets and string quartets at other civic and church events. Ruth was twice selected to be an All-District Orchestra representative. By her senior year, she was 1 of 4 chosen out of one-hundred-four orchestra members to go on to the All-State Orchestra in Reading, Pennsylvania. Ruth was also a talented vocalist but with her commitment to the violin she could sing only when the orchestra wasn’t needed. So she became a member of the Mixed A Cappella Choir blending her voice with 120 other girls and boys which entertained churches, civic clubs, and schools. This group was so good they had invitations to sing in Carlisle and many other towns which in the late ’30’s and early 40’s was quite a distance to travel. Jessica Dragonette and Kate Keith Field, both popular American sopranos of the time, were accompanied by them in their performances at the school. These singers were a great source of satisfaction and pride to the citizens of Altoona. In 1946, Ruth graduated from West Chester State Teachers College with a B.S. in Music Education. While Neil finished his education, she went to work as a switchboard operator for Bell Telephone, playing in orchestras when she could find time. But alas, in 1949, she gave up her bow and fiddle for children, five of her own to be exact, as well as countless kindergartners who came through her classroom as a Kindergarten Teacher in the Lewisburg Area School District. To supplement her teaching credential, Ruth took graduate courses in education at Bucknell University from 1969 to 1973, allowing her to become a PA certified teaching instructor. During her teaching tenure, she taught at three different Lewisburg schools: North Ward, South Ward and Linntown elementary school for a combined total of 18 years. Life was busy for Ruth with seemingly endless family social and sporting events to attend in addition to her classroom responsibilities. But Ruth always lived life with a smile and positive outlook. She cherished time spent with her golfing friends, her quilting & knitting circle, and perhaps most of all her bridge club, whom she played with late into life. And she delighted in being able to share her passion for gardening with other fellow enthusiasts as a former member of the Lewisburg Garden Club. After retiring, Ruth enjoyed wintering in Venice, Florida, where she and Neil met many new friends and reconnected with beloved old ones. Wherever she was living, she never tired of attending orchestral and choral concerts for a love of music was imprinted deep in her heart. Ruth is survived by three sons and two daughter-in-laws, Alan Shiffler and Monica Lam, of San Mateo, CA, Dale and Marcy Shiffler, of Menifee, CA, and Douglas Shiffler, of Lewisburg. She is also survived by one daughter, Sandra Shiffler, of Lewisburg, as well as three grandsons, Jordan and Brett Shiffler, of Menifee, CA, and Brian Shiffler, of San Mateo, CA and one great-granddaughter, Jenalyn Hart-Shiffler, of Menifee, CA. In addition to her husband, she was predeceased by one son, Neil F. Shiffler II, of Lewisburg, in 2013, and two older sisters, Marjorie Pearsall, of Greensboro, NC, and Dorothy Reed, of Elizabethtown, PA, both of whom passed in 2001. The family would like to extend their sincere and deep appreciation to all those who helped care for Ruth throughout her later years. We are eternally grateful. A service in celebration of Ruth’s life will be held at 2 p.m. on Saturday, April 13th at the Beaver Memorial United Methodist Church, Lewisburg, with its Pastor, J.T. Young, officiating. At its conclusion, refreshments will be served for friends and family at the church. An internment service will be held privately in the Lewisburg Cemetery. The family will provide flowers and suggests that, if desired, memorial contributions in honor of Ruth be made to the Neil F. Shiffler Memorial Fund, Bucknell University, Lewisburg, PA 17837.